The Philadelphia Baseball Review released its College Player of the Week awards for the period ending March 18. 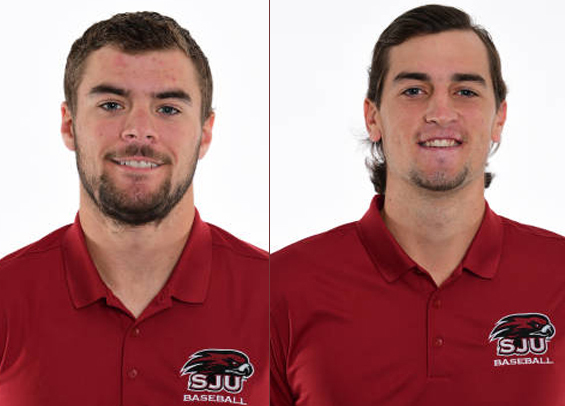 Saint Joseph's junior first baseman Charlie Concannon was named the Philadelphia Baseball Review's Hitter of the Week, while Saint Joseph's junior right-handed pitcher Tim Brennan was named Philadelphia Baseball Review's Pitcher of the Week. Concannon hit .450 (9-for-20) and played a significant role in helping the Hawks win four out of five contests this week. He drove in six runs, scored five times, and five of his nine hits were doubles. He also worked three walks and was hit by a pitch. Brennan tossed seven innings for the Hawks in a 13-1 win over Sacred Heart, surrendering one run on two hits. He walked none and struck out six. Brennan was last named Pitcher of the Week by the Philadelphia Baseball Review on March 5. Over four starts this season he's 3-1 with a 3.81 ERA. The Hawks lead all area schools with eight wins this season and open conference play this weekend.